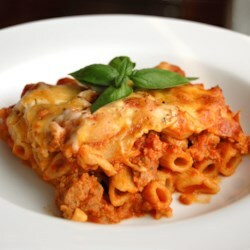 Rewrite of review - This was one of the first recipes I found on Allrecipes back in 2002. Just made it again last night for friends (including 2 kids..who including the adults..went for seconds) and family. This dish makes plenty of leftovers - pack them in tupperware and freeze for another night. Always a fantastic turnout with this dish!! Did make a few altercations though...as always: Didnt realize i picked up Penne pasta instead of Ziti at the store. I omitted the onions. Used hot italian turkey sausage (squeezed the meat out of the casings and cooked it like you'd cook ground beef). Seasoned the meat with pepper, garlic powder, onion powder, and Mrs Dash. Added 2 TBS of minced garlic to browning meat. Added 1 (drained) can of mushroom pieces with stems. Added 2 jars of pasta sauce and let simmer for 15 mins. Halved the amount of (reduced fat/light) sour cream and replaced it with (reduced fat/light) ricotta. And used the rest of the ingredients off the recipe. Layered PAM sprayed Pyrex baking dishes like so...Ziti, sauce, Provolone, Sour Cream, Ricotta, ziti, rest of sauce and Sargento's Italian 6 Shredded Cheese Blend - Mozzarella, Provolone, Asiago and Parmesan. Covered with foil and baked for 30 mins. :) Yummmmy **TIP** Unless you have a big family or are having company...i suggest if you are feeding up to 4 people to half the recipe. Thanks Colleen for a great recipe!